A college student Nan is researching the history of witchcraft. Taunted by her brother and fiancé, who have voiced their concerns, Nan arms herself with resolve and drives to the small New England village of Whitewood. She is glad she was able to count on the support of her professor. A bit anxious but consumed with curiosity, she will soon embark herself on the journey of her life! 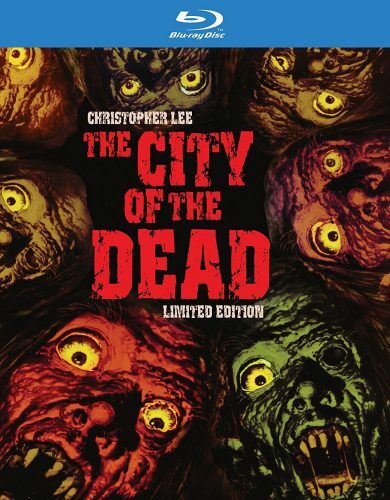 The City of the Dead is a Horror film dealing with a small town that killed off a bunch of witches. The Film has a Hitchcock feel as it brings a little mystery to this black and white horror. The story follows a young college student whom is interested in this small town that has a deep roots to witchcraft. thanks to the course she takes and the persuasion of her teacher she decides to make the trip to the town for some research. After a few weird experiences she goes missing and it alerts her brother and boyfriend who go and try to find her. Did she get taken? Sacrificed? Are witches real? The film was a good follow and the story had me intrigued the whole time. The short run time is nice but could be a tad longer but works if you’re looking to watch a short movie. The film has some edge to it for an older film. No blood or gore but pure mystery and creepiness helps bring the horror. Acting was pretty good and Christopher Lee plays a good role even though he is not the main lead and time on-screen is short. Overall the film was a good watch and I recommend the film classic horror Hitchcock feel type of films. Nothing mind bending but it will keep your attention. The Blu-Ray looks great. The Black and White Picture is sharp with nice whites and blacks. I Say give it a shot and pick this one up. With that said I give this film a 4.5 out of 5. I enjoyed the film for what it is. Not scary but hovers on the horror side bringing some creepy and mystery aspects to the screen.